Denon AVC-X6500H review | What Hi-Fi? We aren’t ones to be easily hoodwinked. In fact, nobody has managed to fool us since we booked that tour of the Norfolk B roads. Even so, a manufacturer’s job becomes ever trickier when attempting to replace a component of our reference system. So familiar are we with the talents of our adopted kit, it can take only moments to make a comparison. The Denon AVC-X6500H is a case in point. Pretty much as soon as we turned it on, we knew that it might end up being fostered by What Hi-Fi?. Though in fact, Denon had already run it in for 24 hours before we switched it on, and we’d recommend giving it that time again to get it really singing. Despite the tweak to the model name, this is essentially a refreshing of the Award-winning AVR-X6400H. So, it’s an 11-channel AV amplifier (Denon has removed the tuner section in favour of a tuner input, so refers to it as an AV amplifier rather than AV receiver) with all the nuts and bolts required for a serious home cinema system. There are eight HDMI 2.2 inputs with eARC and 4K HDR support, compatibility with Dolby Atmos (7.1.4) and DTS:X and the ability to play hi-res music files and share them around the house via HEOS. 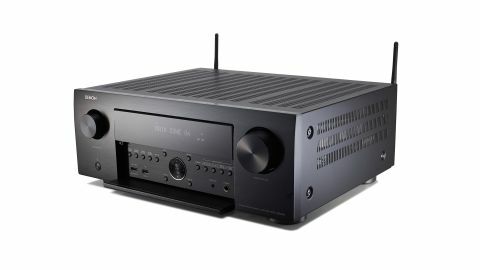 Otherwise, the headline feature updates are those Denon has implemented across its range of home cinema amps: the inclusion of Alexa Voice Control, Apple AirPlay 2 and a phono input giving you a truly one-box multi-use amp. The AVC-X6500H also maintains much the same internal structure as its predecessor, with Denon making numerous tweaks to the circuit design. This means it retains the same overall character, but tunes in further power while facilitating a more sophisticated overall presentation with consistency over all sources. To give Denon credit, it seems to have worked. Had Denon not devised the AVC-X6500H, its predecessor would still be our pick for home cinema amps at this price and you’d hear no complaints about standing still. However, those marginal gains in performance go a lot further than they’d suggest in isolation, making for a more rounded cinematic experience. The quest for greater power, especially in a product already holding its own in terms of muscle, can sometimes tip the balance towards become a fatiguing listen. However, Denon nimbly avoids any such trap. Instead the AVC-X6500H’s extra muscle feels simply more authoritative, relinquishing none of its subtlety when required to tone down its enthusiasm and offering the same impressive levels of detail throughout the frequency range. Denon’s amps have become renowned for their full-bodied presentations, but the AVC-X6500H appears to offer further solidity to dialogue without straying into it becoming unnaturally bass-heavy. The added ‘sophistication’ the manufacturer outlines as one of its motivations for retuning is difficult to assess, but this amp’s handling of both large-scale and subtler dynamic shifts impresses once again. Vocal expression is clearly defined, but not exaggerated, and, as has become tradition while testing a Denon AV amplifier, we are drawn into watching the test film rather than analysing the product. Another welcome trait is Denon’s aptitude for designing home cinema amps that cross over well into music playback, though it’s of little surprise given how well these amps deliver film soundtracks. It makes sense of this range’s option for a second zone, linking it to a hi-fi setup, and saving you a decent amount of money on a separate amplifier. Stereo performance is certainly comparable with the way the AVC-X6500H delivers a film, savouring that warmth and solidity while making the most of the amp’s precision timing and impressive dynamic reach. We could simply have reposted our AVR-X6400H review and headed it with a note saying ‘imagine this, but better’. That wouldn’t of course have taken into account the addition of Alexa Voice Control and Apple AirPlay 2 to Denon’s features arsenal, but would still be a decent summation of the AVC-X6500H’s sonic capabilities. It might not be worth throwing out last year’s model just yet, but this again serves as proof of Denon refusing to rest on its laurels when it comes to leading the market in home cinema amplification.